On Tuesday the latest labour survey was released by StatsSA. The numbers are bad. The number of people out of work has risen above seven million for the first time ever. 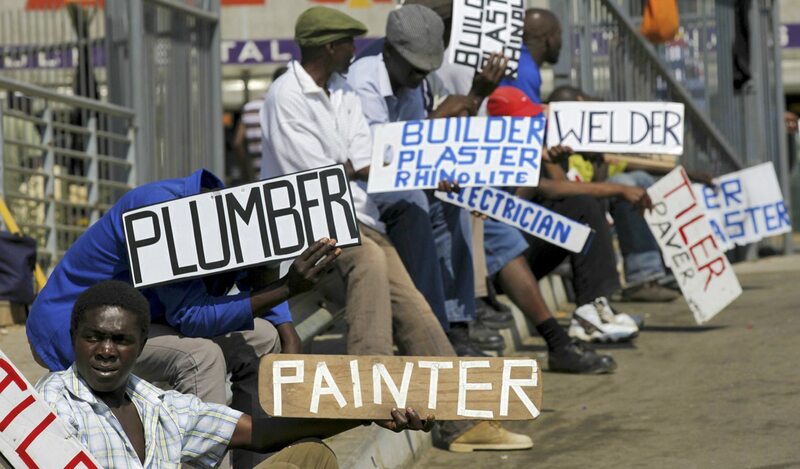 The economy is creating jobs but the number of job-seekers is rising at a faster rate. By PAUL BERKOWITZ. The quarterly labour force survey (QLFS) for the second quarter of 2013 was released on Tuesday. In the months of April to June this year the official unemployment rate rose to 25.6%, while the broader rate of unemployment rose to 36.8%. The graph below shows the trend in the two rates over the last five and half years. . Both measures of unemployment are just a tenth of a percentage point below their records, set in the second quarter of 2011. Over the last two and a half years the official rate of unemployment has averaged over 25%. Although the economy added 100 000 jobs for the quarter, this was not enough to absorb all of the new entrants into the labour market. The total number of employed people rose to 2008 levels of some 13.7-million but the numbers of unemployed and discouraged work-seekers rose to record levels. The number of unemployed people rose to 4.7-million and the number of discouraged work-seekers to 2.4-million. Between these two groups there are now over seven million people without work. The sharp increase in the number of formally unemployed could be given a slightly positive spin: it could mean that some formerly discouraged work-seekers had started to look for work again. The growth in the number of discouraged work-seekers is much more gradual than the growth in the unemployed, but it’s still on its upward march. There isn’t much good news in the official QLFS release, but there is a sliver of good news for the people who follow these sorts of things. StatsSA has just revamped its website and has introduced some handy data analysis tools, including a statistics generator that will give you information down to the municipal level, including results from the 2011 census. Those results should still be taken with a large pinch of salt but if the employment-related statistics can be confirmed by QLFS results, then there is cause for concern. The table below shows the 10 municipalities with the highest unemployment rates. Bear in mind that it is narrow rate of unemployment being measured. The table below gives the 10 municipalities with the lowest unemployment rates. Eight of the 10 are in the Western Cape and the other two are in the Northern Cape. It could be that those areas of the Western Cape and Northern Cape have very low levels of structural unemployment. After all, successful metros, for example, tend to create jobs which attract in-migration. This, paradoxically, can raise the unemployment rate in those metros. Maybe some of the municipalities with low unemployment rates have a high level of economic migration out of them and into to the cities. Maybe they have small populations with low growth. Maybe they are governed better. If these census-related numbers can be cross-referenced with QLFS numbers they might confirm in which areas structural unemployment is worst. We might be able to refine our understanding of unemployment patterns and be able to answer important questions, for example. Is rural unemployment due to failures in rural development? Here are a couple of last factoids gleaned from the new StatsSA tool. They illustrate just how dire and stagnant the youth employment situation is. The median rate of unemployment (ie the municipality that was in 90th place out of 179 municipalities) is 42% for people aged 15 to 34. For the worst quarter of municipalities, youth unemployment is 52% or higher. Maybe most of these municipalities are small and sparsely populated, maybe the absolute number of unemployed people is not as high as a first glance would suggest. Suggesting upsides and looking for silver linings in the employment numbers does seem to be a bit unrealistic – they are miserable. Gross domestic product growth for the year is forecast to remain around 2% and will probably stay below 3% over the medium term.